“Leader is not a title, it’s a way of being." Sue Johnston is fascinated by integrating ideas and sharing stories to help people make sense of their world. Her first career as a reporter shaped her interest in people, finding meaning and purpose, and the discovery that she has a gift for listening. She continues to use this gift in her work today as she helps people expand their communication, teamwork, and coaching skills. Sue is an advocate for thoughtful communication in the ... See More workplace. She believes that speaking the truth and embracing empathy, builds trust and safety. Our conversation explores this, and the true nature of compassion and leadership to not only shape the success of companies, but also individuals. Believing in the best of people shifts not only our mindsets, but also our results. When we choose to lead from compassion, everything is possible. 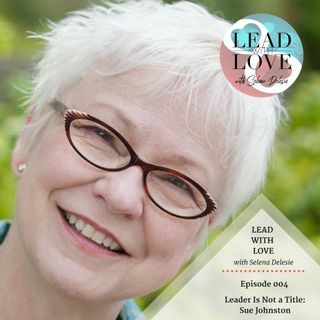 Sue Johnston helps you talk so people listen, listen so people talk, and change the world, one conversation at a time. She's an experienced coach and trainer who specializes in interpersonal communication and teamwork. ​She believes the vital communication in organizations is the interaction between people - and she's trained hundreds of people in face-to-face communication, coaching and facilitation. She's the author of Talk To Me: Workplace Conversations That Work. The International Association of Business Communicators has named her one of Canada's Master Communicators. And she's learning to play the harp.